Clean suede and nubuck leathers without the use of liquids. The Suede Cleaner Kit removes marks from suede leather to restore the original appearance. Kit Contains a cleaning bar that, erases dirt and a bristled brush that restores the nap. 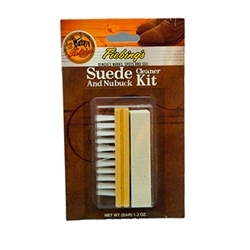 We recommend this kit for all our suede products. Simply rub suede bar in multiple directions over soiled area and brush up the nap with the suede brush.